Home / Affiliate marketing / affiliate marketing for beginners / Blogger on Pinterest / How to earn using Pinterest / How to make an affiliate sales using Pinterest / Stay at home blogging / Who Else Wants to Make Affiliate Sales? Try These Steps! 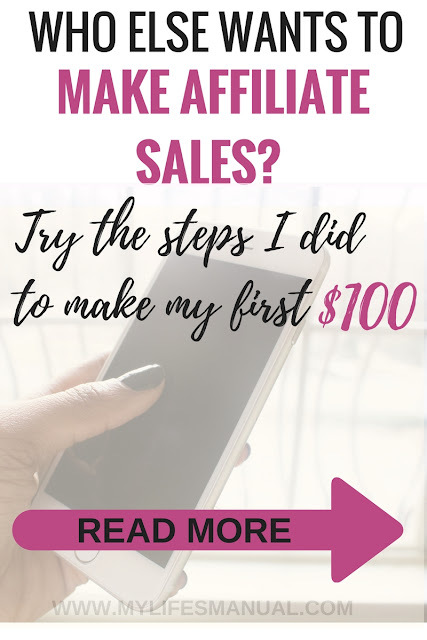 How I made my first $100 from affiliate sales using Pinterest? Have you tried recommending a product to your friends and family? When these people purchased a product that you recommended using your affiliate link you would get a commission. I joined an affiliate program like eBay, Cj Affiliate, and Ultimate bundles (affiliate link). My favourite was Ultimate Bundles. Ultimate Bundles have a product for every niche. They also have a great support and promotional tools available that you can use already. This post contains affiliate links, I might get a small commission when you purchase from this post at no extra cost to you. I only recommend products I use and trust. Grow your blog to thousands per month with the help of the 12 Month Blog Plan and the First Month Blog Plan. Increase your blog traffic and sales. Sign up for FREE TRIAL of Traffic Transformation. Drive massive traffic to your affiliate links, grab the Affiliate Guide Checklist. How to Make People Click on Your Affiliate Links? I shared my affiliate links and blog posts on Pinterest. Manually pinning every day but nothing worked. I got tired and wanted to give up, but I have already invested too much time and hard work to just give up yet. I realized that time and hard work were not the only investments I needed to take. As a new blogger and new to affiliate marketing I needed guidance. I needed to invest in myself and be educated on how things work when it comes to making money blogging and making affiliate sales. I knew that I could use Pinterest to share my affiliate links but I was doing it all wrong. My pins were ugly and I was manually pinning without a strategy. I came across an eBook that would help me make affiliate sales using Pinterest. 1. It promised to speed up my affiliate sales. 2. It promised the promotional strategy to make pins go viral on autopilot. 3. It is affordable compared to other downloadable affiliate marketing eBook online. 4. Influencers are also recommending it. Reviews are excellent. I was right this eBook was perfect for bloggers who are still confused about using Pinterest to make affiliate sales. This is for new bloggers who can't spend yet for an expensive Pinterest and affiliate marketing course to grow their blog and income! This book laid out the Pinterest strategy that you can copycat to make affiliate sales on autopilot. I made $40.00 the first week of carefully implementing the strategy of the eBook. Read my story here and learn from my biggest mistake when I was starting! 1. I switched to Pinterest business account and enabled rich pins. If you are using blogger. Here is how to do it. 2. Reading other bloggers income reports. By reading income reports I was able to find an affiliate program that was already working for others. I was able to determine if a certain affiliate program was profitable to join. I was motivated by other blogger's success stories. From their difficulties when they were starting out until how they became successful. Board boosted was a lifesaver for me. Instead of manually pinning I could schedule my pins and not worry about it, by using Boardbooster I could spend my time on other important things on my blog. I did not have to worry when something came up and I would not be able to work since I got Boardbooster working for me. 4. I Joined a lot of Pinterest group boards. By collaborating with group boards my contents and affiliate links were getting exposed to thousands of people even if I was still growing my followers. Here are the lists of group boards to join for you to start. It would be better if you can join more group boards. 5. I implemented the strategies laid out in this eBook. Putting affiliate links on Pinterest without a strategy is not going to make you money blogging. 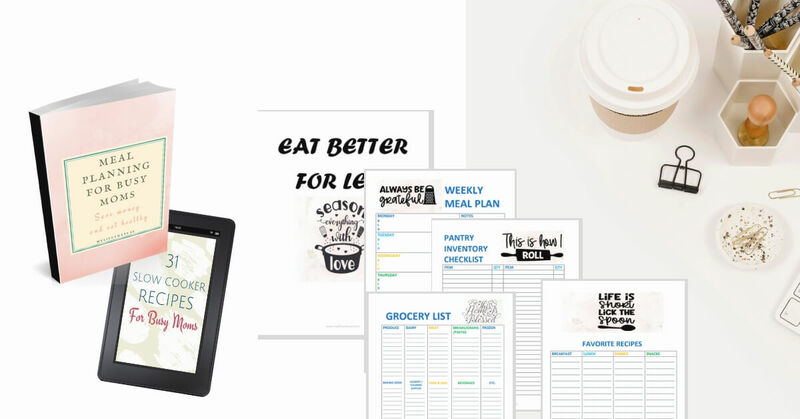 This eBook already made me over $100 from affiliate sales in just a few weeks of implementing the proven strategy using Pinterest. Before I had this book I was super confused and lost on how to schedule all of my pins and give each pin the exposure it needs to go viral without spending too much time manual pinning all day every day. If you are looking for more advanced affiliate marketing strategy or you want to make your first $1000 in affiliate sales this is the right course for you. Don't forget to hit the share button and leave your comments. I'll be sure to find a time and get back to you. I can't wait to check out your blog post too. I just bookmarked your post so I can learn from it. Pinterest is my biggest social media platform and I need to learn how to make sales from it. Thank you Shabby. It is great to hear that Pinterest is on your side, Take advantage of it. Such great advice. I keep wanting to up my pinterest game but never follow through. Your advice will give me some direction so I know what to do and can get started. Thank you for dropping Jen. It takes time to grow Pinterest. Good luck. I've been reading about this ebook for awhile now and I think I'm ready to purchase it. Thanks for your tips. Thank you Tammy. This book has helped me a lot and moved my Pinterest game up. Not only in making affiliate sales but also in getting my content exposed to the right audience. I am still looking for more resources to grow my blog. Get the eBook asap. Thank you for the information. I really need to figure out how to make money off my site. I realize I put too much time in it otherwise. Great tips, I have boardbooster and really like it. It has been very helpful with my time management. I never New where to start with this, bit your advice have gave me great direction. I will look more into this. Pinterest is such a complicated platform. It has all the visual design elements for beautiful pins plus the complexity of the back end SEO with rich pins and tagging and the social sharing from tribes and groups. You need a solid plan to succeed on such a complicated platform. I'm going to bookmark this so I can come back and reread it as I may forget some parts. I appreciate learning about affiliate marketing. I in the past haven't been that Keen on affiliate but now I'm changing my mind. Thank you so much! These are great tips, Imma check them out. This is some great insight. I never considered affiliate marketing before. Thank you for this post. I have requested to join several of the group boards you listed. I look forward to trying affiliate marketing using my pins! In the beginning I only thought Pinterest could bring in traffic, but it's such a great tool for affiliates too. Your suggestions are great guidance. Thanks for the great advice! I have given up on affiliate marketing, but I might just revisit it now that I have some direction. Thanks for the information, I learned a thing or two. This could be quite handy especially for people who are just starting out. Sounds like a great idea for those interested in making some money on their pinterest! Glad you figured this out! Thanks for the information. I haven't gone to affiliate sales just yet. And I am really interested in knowing how well Pinterest helped in making those sales. I have not tried to monetize my blog yet. When the time comes, this guide will definitely be handy as I know nothing about affiliate marketing. First, I need to work on getting more traffic. Thank you! I've been searching for a while for a good text about how to use Pinterest, and this text is exactly what I've searched for. A very informative text! Ultimate Bundles is def my of my favorite affiliate programs as well! They always offer some of the best stuff. Awesome tips..gonna check out group boards too. I tried tailwind tribes before too. Great tips for new bloggers and anyone hoping to monetize their site! And I LOVE the planner shown at the bottom! I have never been successful with affiliate sales so I can't wait to try these tips. $100 goes a long way to feeding my horses each month. Boardbooster and Tailwind are two main tools I used to increase my pinterest traffic game and it worked! Really informative post. I'm going to join some of those pinterest groups. I don't utilize pinterest as much as i should. You tips are spot on. I remember how much I struggled with Pinterest in the begging, before group boars and Boardbooster. Those were my gold mine. I already had the rich pins(really important as well). I have to say I'm starting to get interested in affiliate sales, never tried it. I had never thought of affiliate sales via Pinterest. It is clever! I love Pinterest and ours is growing so fast! There would be so many opportunities to make affiliate sales indeed! I have to admit it is a really interesting idea to use Pinterest to make affiliate sales, it is something I really need to try and look into doing myself. For the longest time I have failed at affiliate marketing, maybe I should try ebooks and change up my strategy. Congrats on earning your first $100. 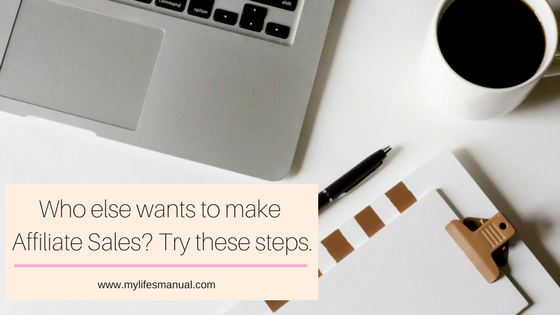 I'm already using most of those strategies without doing affiliate marketing, so maybe it's time to start doing it! I've never really thought about using Pinterest for affiliate links, but it sounds like it works. I'm definitely going to look into doing this myself! im new to blogging and havent actually optimize my pinterest as im not even exactly sure where to start! this is a good guideline! thanks! These are great tips for making affiliate sales. I will have to share this with my Sister. She is just starting out. Wow, I am impressed. I really need to switch to a Pinterest business account. I am trying to use it more often. I love pinterest but I haven't really used it to make money. I only use it for fun and find patterns. Making affiliate sales is a complicated task that requires lots of efforts. With your tips, however, the job has become much easier. Thanks for your helpful post! I have a Pinterest account; however, I do very little with it. It may be time to dust it off. This was incredibly helpful, i need to try out a few of these! The internet offers so many ways to make money. I might have to look into this. Great tips! I'm too scared to try affiliate marketing just yet! Great ideas!! You know I pin every blog post I write but I have never done straight pins with my affiliate links! I am all over this idea! Thank you!! That's so interesting! And congratulations! I need to invest more time to affiliate work if i want to make some money. Thanks for sharing! I know I really need to join more group boards. I know I haven't done nearly as many as I could and I know I have heard how helpful that they are. I can imagine that they can be so helpful in getting the word out about my work. Beautifully demonstrated. This will help newbies get up and at them quickly! I am currently revamping my Pinterest strategy. I'm a little stuck with the rich pins because I have a food blog and I'm on Squarespace (I tried Wordpress, didn't like it). I have basic coding skills so I'm getting there, not as fast as I'd like, but making progress. Your advice is very timely! Great tips! I have not heard of board booster before so I will definitely be checking into that more. I have heard that Pinterest is a great traffic resource but have not tried to utilize it much myself YET. This is amazing to know! I love Pinterest but I am lost most of the time. I will be sure to use this guide. I've been offered to join for an affiliate program, I'm just so worried it would never work for me. I will definitely take a second look at it and put some of your tips to work! Great info here! And it's also broken down and organized very well - so helpful! Thank you! Sounds interesting! I do get some income from affiliates. I have always struggled with affiliate sales, these are awesome tips! This is such a cool post. Very helpful! I haven't really explored Pinterest that much. I'll definitely use this post as a reference. This is definitely something that I need to look into. I never thought to make the sales off of Pinterest. I have never had much luck with affiliates. I need to read this book for tips. Affiliate links are a great tool for bloggers to earn some income. I need to be more active on Pinterest, I have heard great feedback. These are some great ideas. I like affiliate links. They’re great tools. You're doing great! Very interesting and good to know. I don’t know what I’m so hesitant to use Pinterest! I guess it all just seems so overwhelming! I know I need to get into it though because everyone is talking about how must it boosts their traffics! This is a great checklist because these are proven strategies! I have heard people making good money from affiliates but I don't have luck in that area. This is awesome information about affiliate sales. I believe that bloggers can make a lot of money from doing affiliate sales if done the right way. Thanks for sharing the information. What book did you learn from to make affliate sales work for you? I haven't done anything yet, but am looking to monetize my blog soon! Pinned for later and can't wait to look at all these items you suggest. Great post. Even though I've been blogging for 11 months, I am just getting started with affiliates. Im reading as much as I can to understand it. Let's see how it goes. Pinterest is such a powerful tool! I'm so happy that I'm finally getting it, but I'm still waiting to see the big time results. Kudos to you for rocking it! Saving this post so that I can get go back to it when I'm ready to start concentrating on affiliate marketing. Great advice, it sounds like you have been hugely successful! I don't really use pinterest, I don't have the time for it but sounds like I'm missing out! Glad that affiliate marketing works on your blog. I tried some but it was not meant to me. Banners and content publishing is my highest earning products/services. I'm so glad you're finding affiliate marketing works for you, I've not tried it yet. I've heard everyone say how amazing Pinterest is for trafficking c but so far I've not got any traffic from there, I still love Pinterest though, so much great inspiration! Great share! I'm newbie on this blog and will bookmark for reference! So much learning to do but happy blogging! Bookmarking this so that i can come and read this whenever i have a query. Affiliate links seems to be pretty difficult and steep learning curve for beginners. Thanks for sharing these amazing tips. In a blogger life, these kind of suggestions are must to earn some money out of blog. Such a great and informative post and one that I am very happy coming across. i hear so many stories about using Pinterst and I did not realise the importance for a bigger, even to to drive traffic to site. Great information, thank you! I am just starting to get into affiliate marketing for my blog and this helps so much. Good information. I'll have to come back to this at some point perhaps to read it again. Great Post!! Thanks for the share. I never knew there was a business account for pinterest. I just switched to Pinterest business account. I need to get on this ebook! I joined a few of the group boards you recommended. Thank you! These tips and strategies that you shared are really powerful! I haven't started my Pinterest but im really excited to learn how to increase my affiliate sales and thereby income as well! I will have to give these tips a try. I would love to be able to get more affiliate sales. I make money from advertising, and from sponsored posts, but I have tried a few affiliate posts, and come up with nada. I'm gonna save this post! This was super helpful and very informative! I signed up for all of the Pinterest boards you listed. Ive been using Pinterest to grow my blog for only a short time now and I've been ready to step up my game. Thanks! This book sounds like a great resource for people that want to make money from affiliate links! Thanks for sharing these tips! I love all the tips here! I am definitely saving this post so I can come back to it. These are awesome tips that are very helpful. I know we could definitely put some of them in place to help us. Thank you! Wow that is amazing! I just got into affiliate sales this year so I need to step up my game with Pinterest. I really need to invest more work and time in my Pinterest. This is so informative, I will need to study more about this. I love Pinterest. It brings a ton of traffic especially if you take the time to learn it well like you did. Good to know. I've made some money in affiliate marketing, but haven't put 100% into it yet, just because I have other pressing tasks that pay more and have a quicker turnaround. I absolutely do want to invest in this though, since affilaite sales can help buffer when income is low. These are all great steps for making money with affiliate sales using Pinterest. More and more bloggers are finding out that Pinterest is a place to increase traffic and sales. Thanks for sharing the information. Great article. This post is an excellent resource for affiliate marketers and I am one of them. Thanks a lot for suggesting Pinterest tools too. I will try them. Thank you Manoj. What tools do you use to drive traffic to your site? Great post, it was really informative! I’ve always wondered how people could get their start to successfully using affiliate marketing. Great article. As a new blogger, I have a lot to learn about joining blogging groups to grow my blog. FYI, the pink social media banner was covering some of the text in the article and made it hard to read. Not sure if others have had the same issue, but thought I'd pass it along. Thanks again! Oh Thank you Hilda for informing me about the banner. I'll fix it now. Great stuff! I haven’t gotten to affiliate marketing quite yet but I’m just about ready to. Saving this for later! Thanks so much! I'm looking to get into affiliates as one of my income streams and am a little bit scared to start! Need to learn all I can. Will definitely apply your tips! I'm SO glad I stumbled across your post today. I have been really struggling to get some results with affiliate marketing. Thank you so much for sharing! I am excited to check out the book you referenced and to put into play the ideas you have presented. Always sweet to cash in on affiliate sales. Fabulous.